Heavy metal legend Ronnie James Dio passed away on Sunday, his wife Wendy Dio confirmed via his website; he was 67. No official cause of death has been given as of yet, although late last year there were reports that Ronnie Dio was suffering from stomach cancer. He was in fairly good health last month, however, as he was able to appear at the Revolver Golden God Awards to accept the award for Best Vocalist. 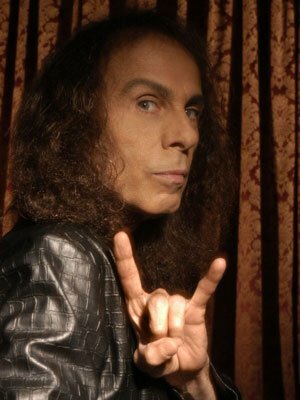 If you’re a fan of Ronnie Dio and would like to remember him along with other fans, you can share your thoughts on his Official Ronnie James Dio Facebook Page. Ronnie James Dio…was an American heavy metal vocalist and songwriter. He performed with Elf, Rainbow, Black Sabbath, Heaven & Hell, and his own band Dio. Other musical projects include the collective fundraiser Hear ‘n Aid. He was widely hailed as one of the most powerful singers in heavy metal, renowned for his consistently powerful voice and for popularizing the “devil’s horns” hand gesture in metal culture. He was collaborating on a project with former Black Sabbath bandmates Tony Iommi, Geezer Butler and Vinny Appice, under the moniker Heaven & Hell, whose first and only studio album, The Devil You Know, was released on April 28, 2009.
next post: Juan-Carlos Cruz Wanted Homeless People To Kill His Wife. Allegedly. 50 queries in 2.412 seconds.